This class is designed primarily for students with no watercolor experience but a burning desire to learn the basics. Experience the thrill of the pigment and water coming together in your creation. We’ll experiment with: different brushes, pigments, techniques, learn composition, plus we’ll paint simple landscapes, animals and flowers. 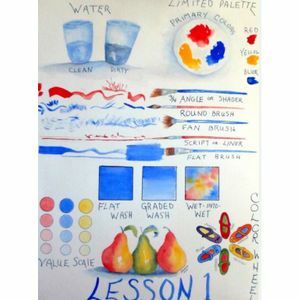 After 4 classes you will know watercolor basics and feel confident beginning your next watercolor class or painting. Students are responsible for all supplies. Open to participants 16 and older. $67 (future members) - Museum members save 10% on tuition. Discount taken at checkout. Watercolor pad, inexpensive 140lb or better weight, cold press, at least 9”x12”. Primary colors, Cadmium red, Cadmium Yellow, and Ultramarine Blue. Later we’ll add Cobalt Blue, Permanent Rose, Lemon Yellow, Burnt Sienna and Sap Green. For a palette you can purchase a plastic palette or large plate. Rounds and Flats, sizes 6, 8, or 10. You will only need 2 inexpensive brushes to start and I’ll have brushes you may borrow. The stores mentioned below have reasonably priced brushes. Robert Simmons are inexpensive and a good value. Sketch pad, #2 pencil, eraser (gum or white plastic), a folder to store your work in. Pam Bleakney is entering her 20th year as a watercolorist. Studied art at Glendale Community College and is a juried member of Arizona Watercolor Association, Arizona Artists Guild and Vanguard Artists and member of Daytona Art League and Florida Association of Women Artists. She previously taught at Chez Nous, Sun City Art Club and PORA in Arizona.